Halong Serenity Cruise is a new junk, belonging to the Cat Ba Express group. Following the outstanding success of the Cat Ba Express, the team realized they could bring something new to the cruise experience. Welcome to Serenity Cruises which introduces visitors to the quieter area of Ha Long & Lan Ha Bay offering comfortable luxury for the discerning customer. We visit a remoter part of the region allowing people to experience the natural beauty and local culture away from the crowds. Longest route (among typical cruise 2 day 1 night tours in the bays). Only 2.5 hours bus transfer from Hanoi through the newest highway (instead of 5 hours as normal tour). Free roundtrip bus transfer Hanoi – Ha Long (no hidden price). Cutting-edge technologies in cruise construction, all cabin is connected to nature with private balconies. For those who book our transfer service will be collected from hotels around Hanoi Old Quarter. Instead of spending 4 hours on the traditional road to Ha Long city, we will shortly arrive at Tuan Chau Wharf by express way after 2,5 hours driving. She anchors far from crowded and touristy area in the calm water surrounded by beautiful islets. Fabulous buffer lunch is served while SERENITY CRUISES starts her sails into to magnificent Lan Ha Bay – an extension of Ha Long Wonder which is much quiet and less touristic. She will pass famous Finger Islet, Frog Islet and thousands of uniquely shaped limestone towers and islands. Back to SERENITY CRUISES after outdoor activities, this is perfect time to relax yourself with a cocktail, Happy hour deal is available from 16.30 – 18.30. Onboard, you may join a traditional cooking class presented by our crew. After the incredible dinner, take your leisure time to chat at the bar, watch the movie in the restaurant, enjoy Spa treatment … You wil stay overnight on boat. Be an early bird for photo hunt and join our Taichi session on the sundeck to refresh your body and mind. SERENITY CRUISES continues her sail to Cat Ba Island, passing amazing karst towers. Tea, coffee and light breakfast is served with fresh air and peaceful surroundings. Our crew will take you to Viet Hai, a small village located in the midst of jungles, covered by high mountains range of Cat Ba National Park. Spending around 30 minutes for biking along, you will feel the peaceful atmosphere, charming scenery of a typical village in the North of Vietnam. During the time well prepared brunch is served, SERENITY Cruises slowly navigates emerald water and thousands of karst mountains towards the Harbour. Terrace Moon Suite offers elegant accommodation for couples to share their travel experiences. Complimentary bottle of wine, daily fresh flowers and fruit, together with an exclusive spa service (foot massage) create a romantic atmosphere. The suite comes with its own private 10m2 terrace with lounge furniture. Cruise itinerary might be changed due to weather and other conditions without prior notice. Swimming or kayaking activities may be not possible due to bad weather. Unused services are not subjected to a refund. Meals onboard are served with seafood, Vietnamese and international style. Any special request for food preference, allergies or dietary requirements should be informed at least 2 days before the departure date. Registration is required with full name, date of birth, nationality, gender, passport number and visa expired date for all passengers. Transfer Hanoi – Ha Long (Tuan Chau wharf) round trip. Full furnished cabin with private Ocean View Balcony. All meals onboard mentioned (01 lunch, 01 dinner, 01 breakfast, 01 brunch). Kayak (2 people share a kayak). Limousine/private transfer Hanoi <-> Ha Long (upon request). Surcharge on Christmas, New Year and Lunar New year. Tips for guide/driver/crew & All other services and items not mentioned specifically above. Azalea Cruises are the leading line in 5-star cruises in Ha Long Bay. 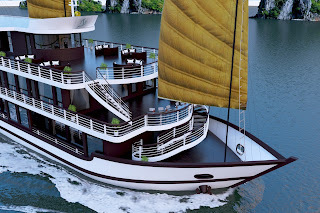 We have BRAND NEW cruises in Ha Long Bay - Lan Ha Bay with the highest level of customer service and an unbeatable relaxing environment that is sure to to exceed your highest expectations of any and all Ha Long Bay cruises. We were the first cruise company that organized this specific cruise through Ha Long Bay - Lan Ha Bay, and we have the deepest knowledge and experience of cruising to all of the best features of this unforgettable cruise route! Joining us, Azalea Cruises on our enchanting travel through beautiful Ha Long Bay will allow travelers to relax and discover untouched areas, rare specialized itineraries we provide our guests to experience less traveled routes that other cruises simply cannot offer to you. 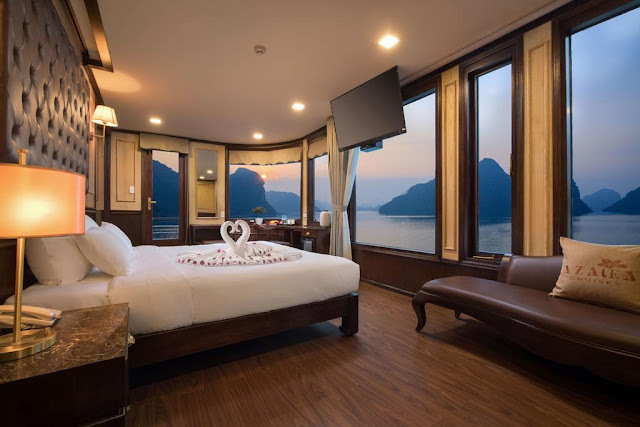 Azalea Cruises house 20 luxury cabins with an elite, professional crew that will provide you the best services during your travels in Ha Long Bay - Lan Ha Bay! 09h10 You will be collected from Hanoi Old Quarter to take the new highway to Got Ferry Terminal – Cat Hai Town, Haiphong City where we arrive at around 11h30. The passengers have a chance to experience on longest and newest bridge in South East Asia area. You can take special tea at Azalea Cruise’s lounge by warm welcome.